We are also unsure if he is going to play the role of the main antagonist or it’s a test footage or Death-Stroke is having a cameo in Justice League. However, we now know that we would see him at least in one of the two movies. He is coming to the DC Movieverse. For now, we can take it as a sequel to all that stuff which prevails regarding Henry Cavill and the black Superman suit. But, the video by Ben Affleck can be treated as solid evidence that Deathstroke is going to come in the DC Extended Universe. The video posted by Affleck seems to be a footage which shows the legendary DC Comics assassin Deathstroke walking down some sort of massive aircraft bay. However, we haven’t been able to identify yet that where this is from. Based on the ongoing filming, JL seems to be the answer as it’s the only movie currently filming. Moreover, it appears that Deathstroke is in the hangar of the Flying Fox (the large aircraft of Batman which he uses as the Justice League’s base of operations) in Justice League. Moreover, we still don’t know if it’s real or just a prank. But, we are assuming it is real. Else, it would be the craziest and a big bluff which we came across in a long while. It is because it’s not just the costume but the whole filming scene. It may be possible that Ben Affleck has just unveiled the next big DC Comics character to the DC movieverse. It may be the off-camera footage. Ben is reprising his role as Bruce Wayne / Batman in Justice League. 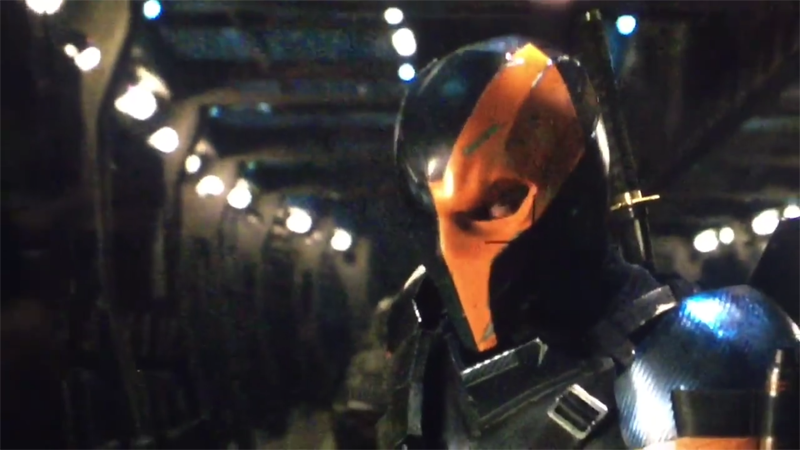 Moreover, the identity of the actor playing Deathstroke in the footage is not known yet. It may be possible that he is the same guy who played a role in TV series ‘Arrow’. The showrunners also said that he is not going to return soon as he already has been a part of another DC project. Some sites are predicting that he is Joe Manganiello behind the mask. Next articleKumkum Bhagya 29th August 2016 Episode: Aaliya decided to take revenge from Sarla ?